Keyword research is an activity you undertake every now and then. If you have a clear definition about the product or service you want to ‘sell’ with your website, you should be able to come up with keywords, related keywords en even more related keywords to make your awesome website (more) findable. As your product and the market will evolve, your keyword strategy should do the same. The keywords you want to focus your SEO on, should closely resemble the vocabulary of your audience. In order to come up with the proper keywords you really have to get inside the heads of the people who search for your website. What terms will people use? How do people search? Which question does your website answer? You should create a list of all search terms people could use and think of combinations and nuances within these search terms. Google Trends allows you to compare the traffic for sets of keywords. You can even see the difference for numerous geographical regions. It’s very important to check Google Trends if you expect that some of your keywords are seasonal, for instance due to regulations, holiday seasons etc. What are people looking for on your site? These terms are keywords in the vocabulary of your actual audience and should definitely be added to your keyword list. Do not forget to look at the keywords people filled in that didn’t get any results: this was stuff people were expecting but didn’t find. You can look into the results of your internal search engine with our Google Analytics for WordPress plugin. These keyword research tools should make it easier to create a list of relevant search terms. You should make sure to create awesome landing pages for keywords you want to be found on. You should also think about cornerstone content articles and a great internal linking structure in order to make your SEO strategy complete. In our Content SEO eBook we dive munch deeper into keywords, landing pages and long tail keywords. 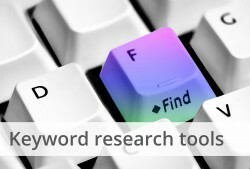 This post first appeared as Keyword research tools: which ones to use? on Yoast. Whoopity Doo!